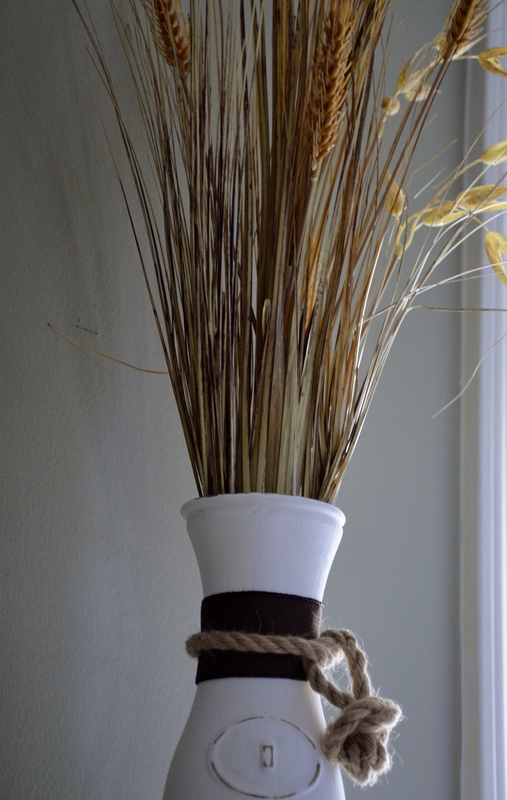 The spirit of fall and cozy coastal vibes all in one DIY, with the help of rope, distressed paint, and “sea oats”. Getting into the autumn spirit means it’s time to bring out the pumpkins, spiced tea, and apple cinnamon candles! (Ok, so maybe I eat pumpkin muffins and drink spiced tea all year round, but especially so during fall.) It’s also a great time to pause and savor the cooler air and beautiful changing scenery if you live in an area where the leaves change color. As much as I love the orchestra of color changes, I also love a cozy autumn by the coast (not surprising, I know). So I decided to make a DIY fall craft for a decoration that’s neutral and sea-inspired, but still captures the warmth of autumn. What makes this autumn-y, yet sea-inspired decor? Well, the sea oats, distressed paint, and nautical rope detail along with rich brown ribbon make for a subtle coastal combination that goes with the fall season. But I really think that this craft works all year round too – so I may just keep it out even after fall has passed! Paint the glass container with chalky paint. I did 2 coats. 2. Once dry, sand any of the raised elements to distress it. 3. 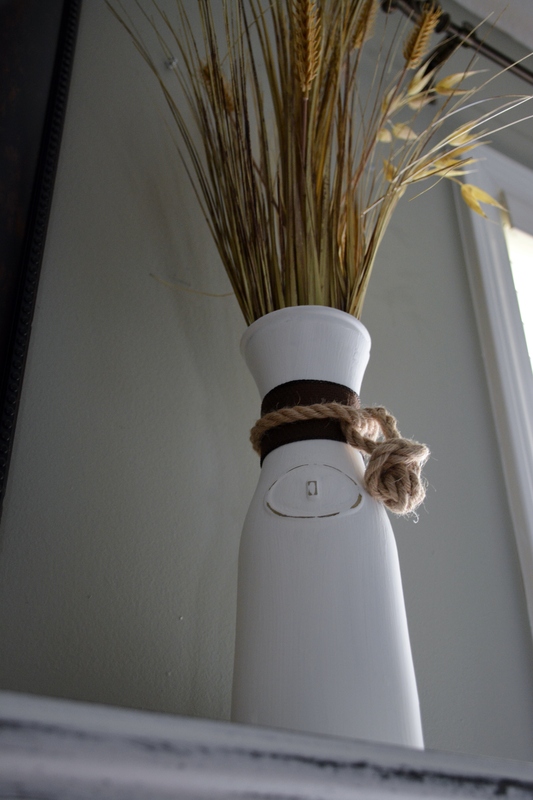 Cut a piece of brown ribbon to fit around the neck of the vase, with a little extra length (1 inch). Fold the edges in on each side so that it doesn’t fray. 4. Hot glue the ribbon to itself around the vase. With plenty of rope on each side (at least the length of the vase), make a loop as if you were tying the first step in your shoelaces. 6. Then twist the rope over itself down the length of the vase. 7. From here, take the ends of the twisted rope and tie a knot with itself. 8. Now that the ends of the rope are hanging, hot glue them to the back, making a ball. 9. Add the “sea oats” and enjoy! 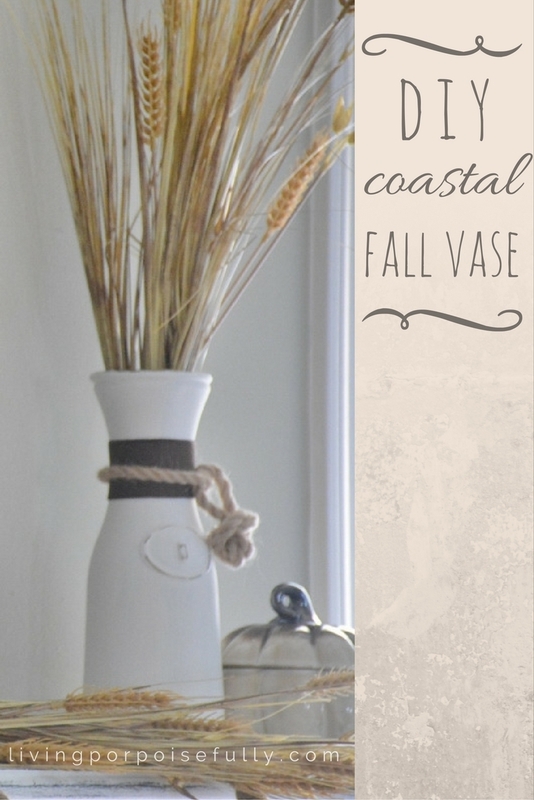 I ended up making another one to have two for our coastal fall mantel (click here to see!). Beyond cute!! Coastal + fall?? two of my absolute faves! You got my attention- I need to follow you! Thank you, Smitha! Those are two of my absolute faves too!! 🙂 I checked out your blog and love your DIY’s. Excited to connect with you!